This is a pioneering, multi-empire account of the relationship between the politics of imperial repression and the economic structures of European colonies between the two World Wars. Ranging across colonial Africa, Southeast Asia and the Caribbean, Martin Thomas explores the structure of local police forces, their involvement in colonial labour control and the containment of uprisings and dissent. His work sheds new light on broader trends in the direction and intent of colonial state repression. 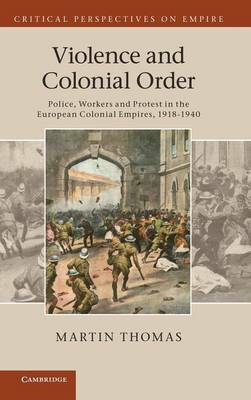 It shows that the management of colonial economies, particularly in crisis conditions, took precedence over individual imperial powers' particular methods of rule in determining the forms and functions of colonial police actions. The politics of colonial labour thus became central to police work, with the depression years marking a watershed not only in local economic conditions but also in the breakdown of the European colonial order more generally.